2 months 2 days ago. PRISM Quartet updated their status. PRISM's residency at Temple U hits on Thursday and Friday, featuring two FREE concerts! Thursday evening, jazz saxophonist Chris Oatts joins us for a recital of PRISM commissions. Friday, PRISM and the TU Wind Symphony under Patricia Cornett give the Philly premiere of William Bolcom's "Concerto Grosso." PLUS, PRISM will conduct a master class, clinic, seminars, and composer reading, free and open to all saxophonists. We hope to see you there! https://www.prismquartet.com/concerts/templeresidency/ 2 days 20 hours ago. Just discovered that PRISM and The Crossing were featured on a December episode of New Sounds with John Schaefer on WNYC. Music by Gavin Bryars, Roshanne Etezady, and Huang Ruo. Have a listen to the podcast! https://www.newsounds.org/story/3873-music-bryars-crossing-prism-quartet/ 1 week 1 day ago. Today at 3 PM, PRISM's Matthew Levy and composer/pianist Uri Caine are guests on WMBR's New Edge Program with host Ken Field to discuss the Quartet's new release, "The Book of Days." Listen online at https://www.wmbr.org/ or at 88.1 FM if you're in the Cambridge, MA area. 1 week 2 days ago. ANNOUNCING PRISM Quartet's Residency at Temple University, April 25-26. CALLING ALL SAXOPHONISTS: all residency activities are free and open to saxophonists from throughout the region. https://mailchi.mp/prismquartet/temple?e=[UNIQID] 2 weeks 2 days ago. PRISM Quartet updated their cover photo. 3 weeks 2 days ago. 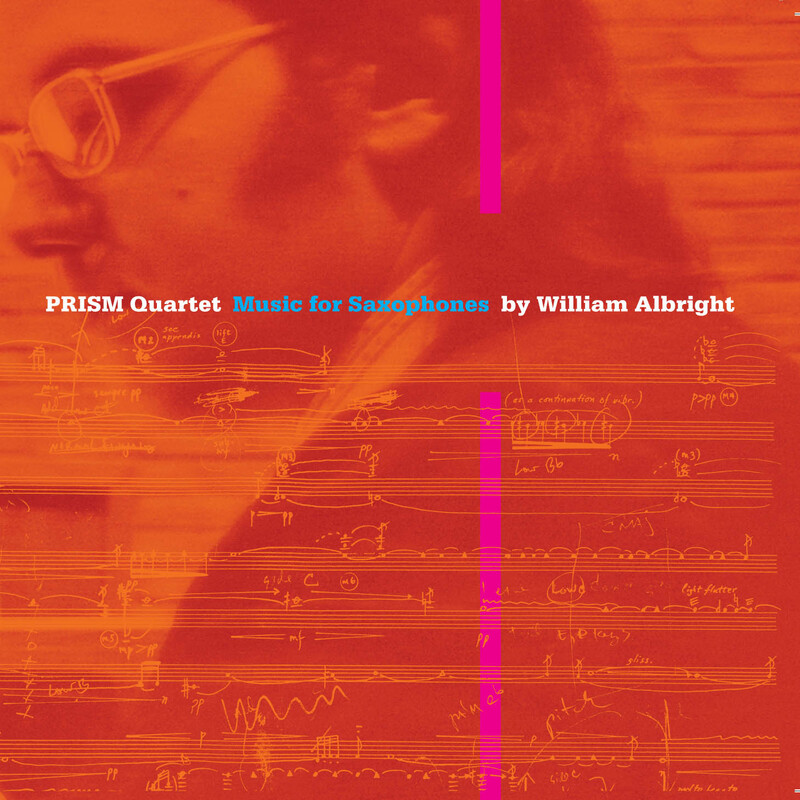 The PRISM Quartet pays homage to William Albright (1944-1998) in their latest innova release. This remarkable disc of Albright’s principal works for saxophone offers powerful testimony to the full range of his personality and his fascination with the expressive power of the instrument. A composer whose works move from sublime laments to raucous jazz, Albright created an extensive body of saxophone repertoire that is at once virtuosic, soulful, and daringly eclectic. His deep affinity for the instrument lasted throughout his career, until a long struggle with alcoholism led to his untimely death at the age of 53. Albright exerted a profound influence on the artistic development of the PRISM Quartet during the ensemble’s formative years at the University of Michigan in the 1980s, inspiring them to champion new music with over 100 commissions by many of the nation's most celebrated composers. The disc features “Fantasy Etudes for saxophone quartet,” commissioned by PRISM in 1992, which Albright once described as “intended to turn the sax on its side” with undertones of Highland bagpipes, steam engines, Victorian pump organs, and the big band sounds of 1950s television police dramas; “Sonata for alto saxophone and piano,” a masterful cornerstone of the saxophone repertoire, moving between blistering energy, abandon, and profound sadness; “Pit Band for alto sax, bass clarinet and piano,” a tongue-in-cheek parody of an evening’s worth of theatre music, digested and compressed to a few minutes; “Doo-Dah for three alto saxophones,” Albright’s first saxophone work, which melds three saxophones into one lush timbre, with roots in American popular song, Southern gospel music, blues, and free jazz. ; and “Heater: Saga for alto saxophone and symphony band.” Taking its name from the gangster era slang term for a machine gun, “Heater” reflects Albright’s signature combination of contemporary harmonic language infused with jazz idioms of the 1920s and 30s. This tribute album of music for saxophones is from the Philadelphia (and New York) based PRISM Quartet, which includes three of Albright's students. Matthew Levy, who plays tenor and alto in the group, recalls his early support. "He encouraged us to perform more demanding repertoire than the existing pool of primarily French conservatory works. His encouragement in no small part led us to commission an extensive body of repertoire unique to PRISM," Albright's music, as displayed here, is delightfully eclectic. It is united by a sense of adventure and wit. The Fantasy Etudes, the major work on the CD, is six pieces that seamlessly express a wide range of music, including jazz (Ellington in particular), impressionism, and modernism. His language is accessible, yet challenging, worthy of, indeed, crying out for more than merely casual listening........ Performances are terrific. PRISM is completely in the groove, and is joined by some first-flight colleagues, including bass clarinetist Michael Lowenstern and pianists Marilyn Nonken and Matthew Hershkowitz. Production values are also excellent, including very good sound, and extremely well written and extensive program notes by Glenn Watkins, another colleague of Albright at Michigan. Towards a satisfying explanation: Poking in open wounds with a broken heart. It might seem odd that one of the rare albums dedicated to the work of William Albright should be dealing exclusively with pieces for saxophones. On the other hand, there is a lot to be said for this choice: Throughout his career, Albright has monoperspectivally either been placed in the drawer of teacher or eccentric organ virtuoso. Both of which are valuable aspects of his personality, but have made it hard on following generations to get to the heart of his oeuvre. Then again, almost any approach to fully explain William Albright is doomed to fail. In his scores, a clear tonal and a recognisable melodic language meet oblique sheets of timbre, Jazz heads for a rendez-vous with Contemporary Composition, restless dynamics are confronted with breathtaking paralysis and carefree moments of life are bleeding into naked fear of death. It is a style which can probably not be “understood” on purely rational terms or on the level of personal experience on the side of the listener. It requires not only a certain openness of mind, but also active empathy to connect with the music – which could explain why Albright has remained in the medial shadows despite offering a welcome alternative to overly analytical techniques. This may finally be offset by “Music for Saxophones”. As the Prism Quartet shows, emotions are the primary key to the work of William Albright. His pieces are filled with sudden twists and turns, moments of sound poetry and jagged edges, sharp contrasts and gentle flow and they rarely sit still for more than a minute in a row. But at their core, they are almost always accessible and relate to the most basic human sensations. This, in combination with the stark contrast between refined harmonies and popular outbursts (such as the BigBand intermezzo in “Heater”), lends them a touching bipolarity: It sometimes sounds like a composer in need to reconcile opposites which can not and should not be reconciled, like a man poking in open wounds with a broken heart. Of course, the most obvious reference in this regard is the second movement of the “Sonata for alto saxophone and piano”, a tragic and remorselessly shattered lament. Albright introduces the downwardly bent progression on the piano, then allows the saxophone to support the dirge with a proud hymnal melody, which gradually fades into broken chords. Little by little, the track disintegrates, atonal disruptions breaking and entering at will, mirroring a psychological breakdown. After the scene has reached its climax, consolation sets in, sweetly rocking the last few minutes to sleep. On other occasions, Albright uses slow tempos to focus on aspects of sound. He clearly loves the Saxophone’s character both in Jazz-settings as well as in chamber musical contexts and does not feel ashamed to rely on its original timbre (with the sole exception of “Pypes”, in which the Prism members try to emulate playing techniques of the bagpipe). The 25-minute, six-part “Fantasy Etudes for saxophone quartet” brings together a series of interrelated movements, opened by an introduction, in which all aspects melt into a vibrant, seamless collage. Rhythm is another important element on “Music for Saxophones”, with either sub-groups of the quartet laying a foundation for the others to work on or complete passages being frantically repeated, leaving a sometimes devastating impression. Overall, the production of this album is rather aimed at displaying the instruments’ true colours, instead of distorting them spectacularly. But underneath this unadorned surface, a prismic world of happiness and drama unfolds unfettered, leading one closer towards a satisfying explanation with each step. When the stars are in alignment, the relationship between composer and ensemble can be truly magical. Such is the case with the Prism Quartet and the composer the late William Albright. Albright’s extraordinarily broad palette produces music that is instantly captivating, accessible and yet truly adventurous. The 79-minute CD begins with a 6-episode sonic triptych, “Fantasy Etudes for saxophone quartet” dedicated to Gyorgy Ligeti. The pieces form a tour de force exploration of the timbral possibilities inherent in the instrument grouping. The saxophone family produces a staggering variety of sounds, from French horn, bassoon, and oboe to bandoneon, pipe organ and tuned percussion. The Prism Quartet’s reading of the “Etudes” bristles with intelligence, energy and commitment. From train whistle slides to raucous baritone growls, “Etudes” is an encyclopedic examination of the saxophone’s potential. “Pit Band for alto saxophone, bass clarinet and piano” adds virtuoso bass clarinetist Michael Lowenstern, who may familiar from his recording of Xenakis “Echange”. The work glistens with kaleidoscopic colours and dances with rhythmic juxtapositions. Other works include “Heater for alto saxophone and band”, “Doo-Dah for three alto saxophones” and “Sonata for alto saxophone and piano”, all of which are superbly performed and vividly recorded. A fine CD of challenging music by the American composer, pianist and organist William Albright (1944-1998). If you like saxophones, you’ll have nothing to fear.